Before you can drive home that shiny new Toyota RAV4 or budget-friendly used Toyota truck, use our online car payment calculator to stay on budget. O'Brien Toyota has a large inventory of new cars for sale for Greenwood drivers, so calculate your monthly auto loan payment with ease. Vehicle Price: If you already know which Toyota you want to see in your driveway, or you’ve already budgeted what price you can afford, put that number here. Interest Rate: Depending on your credit score and credit history, your interest rate will vary. Get pre-approved to find out what loan rates you’ll qualify for by applying for financing online. Loan Term: This is how long your loan will last. A longer loan repayment means smaller monthly payments, but the capitalized cost will be more. Down Payment: This is the amount of cash you can put down on your vehicle right away. This amount will be subtracted from the vehicle total and reduce your loan amount. Trade-In Value: Use our simple Value Your Trade tool to find out about how much your current car, truck, SUV, or minivan is worth. Put that amount into the Trade-In Value section to subtract it from the cost. Fill in all of the categories, and just hit the “calculate” button. Adjust the categories in our loan calculator until you find that sweet spot that fits your vehicle needs and your budget. Not ready to buy or don’t have much cash for a down payment? Check out our Toyota Lease Deals for a $0 down lease! You’ll tend to have lower monthly lease payments than monthly car loan payments. Now that you’ve used our online monthly car payment calculator, you’re probably ready to take a test drive, whether you’re looking for an Indianapolis Toyota used Highlander, or new Toyota trucks and SUVs for sale near your job in Carmel. Feel free to ask our finance department any questions you might have about automotive financing, and fill out our quick online car loan application. 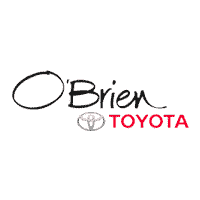 We’re sure that O'Brien Toyota is the Toyota dealership in Indy to match you with the best new or used Toyota for your lifestyle, and our testimonials show why we’re Indy’s ONLY 13-time President’s Award winner.